After a gig Wednesday night in Tijuana, the Desert Daze Caravan returns to the city with a performance at The Wiltern. The caravan – which includes Ariel Pink, DIIV, Nick Hakim, SUUNS, JJUUJJUU – plays its closing nights this weekend in San Luis Obispo and Santa Cruz. ARIEL PINK – DESERT DAZE CARAVAN II, Thursday, May 17, at 7 pm. THE WILTERN, 3790 Wilshire Boulevard, at Western, Los Angeles. 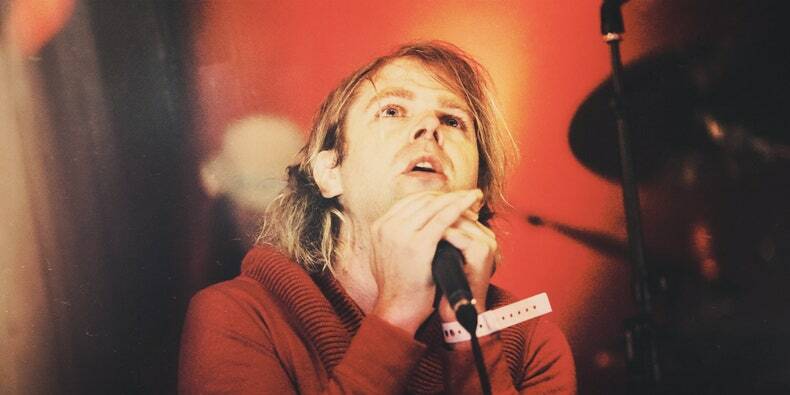 Ariel Pink. Photograph by Ellie Pritts. This entry was posted in MUSIC, PERFORMANCE and tagged Ariel Pink, Desert Daze, Desert Daze Caravan, DIIV, JJUUJJUU, Nick Hakim, SUUNS, The Wiltern on May 14th, 2018 by Barlo Perry. DESERT DAZE—the Joshua Tree music festival where fans converge to see their favorite bands, and enjoy the campgrounds and metaphysical offerings of the Mystic Bazaar—is back. Iggy Pop and Spiritualized are headliners, but of particular interest are scheduled sets by Ariel Pink and John Cale. ARIEL PINK, Friday, October 13. JOHN CALE, Saturday, October 14. DESERT DAZE 2017, Thursday, October 12 through Sunday, October 15. INSTITUTE OF MENTALPHYSICS, 59700 Twentynine Palms Highway, Joshua Tree, California. ARIEL PINK—DEDICATED TO BOBBY JAMESON, out now. JOHN CALE—FRAGMENTS OF A RAINY SEASON, out now. Cover of new album by Ariel Pink; and John Cale, photographed by Julien Mignot. This entry was posted in MUSIC and tagged Ariel Pink, Dedicated to Bobby Jameson (Pink), Desert Daze, Fragments of a Rainy Season (Cale), Iggy Pop, Institute of Mentalphysics, John Cale, Spiritualized on October 10th, 2017 by Barlo Perry.